Want results like this? Get started with our BLM and LSO packages! The Santa Barbara Athletic Club is a full-service fitness and athletic club in Santa Barbara, CA. Though a state of the art gym in the area, the club’s online visibility had much room for improvement, being found past the 50th result on Google when searched under both “Santa Barbara Gym” and “Santa Barbara Fitness” a few months ago. 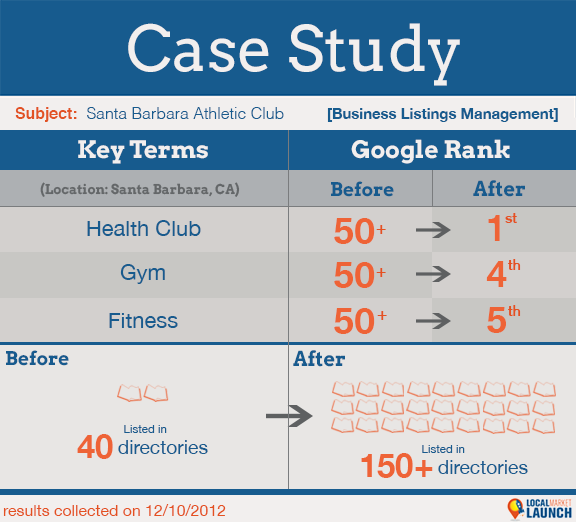 Collectively, these two key phrases gather more than 6,000 local monthly searches, meaning the Santa Barbara Athletic Club was nearly invisible to 6,000 potential customers and new members. Determining they no longer wanted to ignore the online traffic that could be directed their way, the gym decided to sign up with us in hopes of enhancing their search presence. On October 11, 2012, the Santa Barbara Athletic Club was signed up for business listings management. Despite the local competition, we felt BLM would be a good fit for their needs. The Santa Barbara Athletic Club’s results were substantial. In a few months time, many fitness-related key terms were optimized, flying their website to the first page of Google for important searches such as “Gym in Santa Barbara” or “Fitness in Santa Barbara”. When typing in “Health Club in Santa Barbara”, their site is now the number one result. With their newly leveraged online presence through local search optimization, the Santa Barbara Athletic Club is now a top search engine result to all gym nuts looking for a great local fitness club. 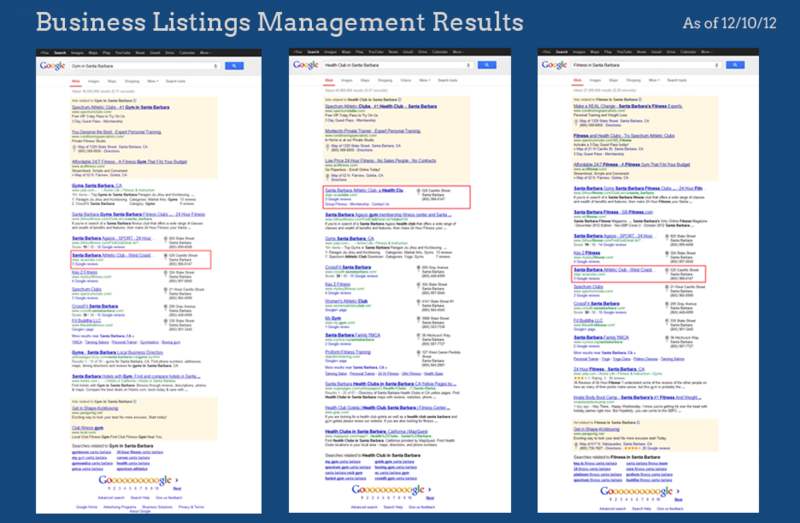 Want to optimize your gym’s local search results? Check out our plans and packages today!